Pool Remodeling Atlanta: Should You Remodel or Build A New Pool? Have you been enjoying the same Atlanta, GA, pool for several years? Maybe you’ve just bought a home that has a pool but you’re not sure if it’s right for you. For pool remodeling Atlanta homeowners count on us for great solutions. 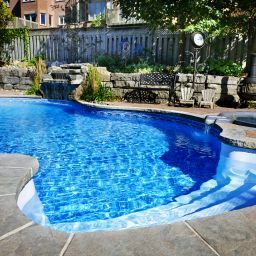 We provide pool renovations Atlanta residents trust, along with other outdoor hardscapes, designs and patio remodeling Atlanta residents love. Better Functionality: If the size or configuration of your family has changed, a different type of pool might make sense, whether larger, smaller, a different shape or a new location. Add Water Features. A remodeling project lets you add additional special features to your pool or pool area. 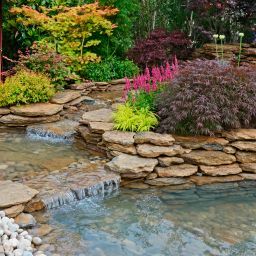 Water features add depth, dimension, conversation-starters and a new look to your pool area. What features available? How about a waterfall, fountain bubbles, deck jets, pool jets, water slides, connected hot tub, or resistance pool? Improve Lighting. Sometimes a remodeling project incorporates new features that help keep you, your family and your guests in the spotlight. Lighting design allows you to enjoy your pool longer each day. Today, with the introduction of LED and fiber-optic lighting, homeowners have more flexibility to create the lighting schemes that work best. Better Technology and Savings. 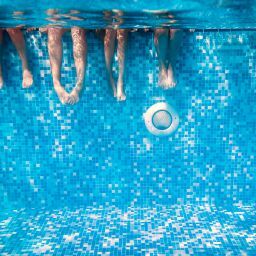 With the right remodel project, you can improve the equipment and energy efficiency of your pool. Installing a high-efficiency pump can reduce energy consumption by 30 percent to 45 percent. Pumps come in two-, four- and variable-speed models, which can affect energy usage and cleaning frequency. Pool covers and solar energy can also reduce the amount of energy cost. Safety First. A remodeling project is a great time to consider whether you have the right security features in place. Fences are the most common measure and are typically locked and child-proof. Safety nets prevent children from accessing the pool and can be removed or replaced in as little as 5-10 minutes. Safety covers include extra straps that keep the cover taut to the deck. Finally, new anti-entrapment features prevent hair or limbs from being sucked into a pool drain. A New Finish. 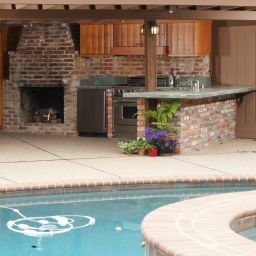 Pool finishes today come in a range of materials, colors, and patterns. A pool finish alone can breathe new life into your pool area. Pool renovations Atlanta homeowners trust is just one aspect of our work. We also offer new pool installation services. Our talented teams work with you to create the right landscape design and pool shape and style. For more than 30 years, we’ve worked with homeowners to create innovative and bold designs that make a splash. We’re not done with the pool either. We provide patio remodeling Atlanta residents love, along with landscaping, sound systems, fireplaces, fencing, grottos, fire pits, pergolas, outdoor kitchens, bars, spas, fireplaces, irrigation systems, and all types of hardscapes. Have you seen our feature on Best of The Best Television? Check out some of our past work and testimonials from our very satisfied customers!